For more Information on our FREE Health & Wellness Programs, contact Lisa at 908-218-1004 OR email BetterHealthBetterLife@NMRNJ.com, OR Fill out our Event Request Form. NMR was invited to provide screenings and a lecture to help educate the employees during the Insmed Health Awareness Week. Employees were able to participate in Body Composition & Diet Analysis screenings and Foot & Arch scans. Dr. Sferra also presented a lecture on Overcoming Weight Loss Resistance. NMR was invited back to support the Annual Employee Health & Wellness Fair. Acupressure screenings were made available to educate employees on the drug-free option to relieve pain. Body Stress Assessments were also provided to address the physical stress that one’s posture may be placing on the body. NMR was invited to present the Stress Reduction Techniques Workshop for the employees at OCD in Raritan. Participants learned 5 different techniques to feel refreshed, de-stressed and relaxed for a more healthful life. NMR was invited to provide Postural Stress Assessments during the annual Employee Health Fair. This screening helps people recognize how postural stress may be affecting their health and overall stress burden. NMR provided therapeutic chair massages and blood pressure screenings to help create an atmosphere of wellness at Financial Resources. NMR supported the annual Health & Wellness EXPO by providing Postural Stress Assessments & Functional Movement Evaluations. Dr. Sferra also presented his Relieving Muscle Stress at the Workstation lecture. NMR supported their employee Health Fair by providing Posture Analysis Screenings to educate their employees on how spending hours each day with our head bent down at mobile devices is putting excess pressure on the spine and puts us at rick for poor posture, back problems, headaches, neck pain and muscle tension. Natural Medicine & Rehabilitation was invited to provided Pain & Flexibility screenings to support September’s Pain Awareness Month. Our Pain & Flexibility screening will have participants gain insight into some of the pain and disability they may be experiencing from neck, shoulder, back and lower extremities. They learned how their flexibility, mobility & muscular balance impacts their health. Dr. Sferra was invited as a guest speaker to present his Relieving Muscle Stress at the Workstation lecture during their Corporate Wellness Week. During the presentation participants also enjoyed learning postural exercises that relax tight muscles right at their workstation! NMR was pleased to support the Health & Energy Fair once again at Ethicon by providing Body Stress Assessments and Therapeutic Chair Massages. Participants learned how postural stress may be affecting their health. They received personal recommendations on how they can start to improve their health and reduce stress immediately. NMR was invited to provide a lunchtime screening to the employees at Philips Lighting Company. Posture Analysis screenings were made available for participants to learn how postural imbalances may be contributing to various health symptoms and complaints such as headaches, neck and back pain, and muscle tension. NMR attended the Corporate Onsite Health & Wellness event for the employee of HCL America and their families. NMR’s Acupuncturist provided an Acupressure Trial for people to learn about the benefits of Acupuncture without the needles. Participants were educated on this drug-free option to relieve pain for people suffering from headaches, migraines, back, neck and joint pain. NMR was excited to partner again with the Healthy Living Program Coordinator to make their Annual Healthy Employee Day a great success! We attended with our Workplace Wellness program to educate their employees on the benefit of Acupuncture as a drug-free option to relieve pain. Dr. Sferra was invited back to Colgate to educate their workforce on ways to reduce muscle tension and minimize its progression into larger problems. His Relieving Muscle Stress at the Workstation presentation is geared towards those who spend hours each day sitting at their desk. NMR provided Therapeutic Chair Massages to support the Environmental Health & Safety Fair hosted for the employees of Saint Gobain. Participants learned and experienced how massage therapy aids in the relief of muscle spasms and helps reduce not only physical but mental stress. NMR was invited back to support the Annual Environmental, Health, Safety & Sustainability Fair at J&J Health Care Systems. Their “Safety Culture” theme for the day was reinforced with NMR’s message of being safe by preventing injuries and providing the Functional Movement Screening. The screening finds the weak link in primary movement patterns and corrective exercises are then tailored to the results of the screening for each participant. NMR was invited to support a Summer Stress Reliever Day at Ethicon. Our Massage Therapist provided relaxing chair massages and eased away stress & muscle tension. NMR supported the Annual Summer Environmental Health & Safety Fair by providing the Acupressure Screening. Participants enjoyed learning about how acupuncture can be used as a drug-free pain relief option for people suffering from chronic pain. The tenants and employees at Advance Realty were invited to enjoyed the Body Composition Screenings provided by NMR. The screenings were held in the Fitness Center and attendees learned their percentage of lean muscle tissue versus percentage of body fat. Along with this information they also received a personal review of their nutritional habits to get them on the road to healthy eating. Dr. Sferra was invited to speak at OFS Optics. His Getting Real with Fitness presentation helped kick off the Grand Reopening of their Fitness Center. Attendees learned how to take action, get motivated and stay on track with an exercise program that can fit into busy lifestyles. The employee fair at Janssen is attended by approximately 600 associates coming to learn more about Environmental, Health, and Safety on campus and at home. NMR educated their employees on how they can reduce the risk of injury. Our screening finds physical imbalances and gives corrective exercises based on the individual results of the screening. Natural Medicine & Rehabilitation provided our Functional Movement Assessments to help employees prevent injuries and learn corrective exercises based on the screening. Natural Medicine & Rehabilitation was asked to visit Financial Resources during the lunchtime hours to offer therapeutic massages to their employees to help reduce stress from the Holiday Season. Employees were able to enjoy a little relaxation and get rejuvenated to finish up the rest of their work day. NMR offered the Body Stress Screening to the members of Gold’s Gym. This unique health screening is designed to help people recognize how postural stress may be affecting their health and overall stress burden. NMR was invited to participate in the Somerville Middle School’s Health Fair for the students, staff and parents. The staff was able to participate in the Foot & Arch Scan which can detect many pain syndromes and problems of the musculoskeletal system. The parents were able to enjoy a few minutes of massage therapy which helps to relieve stress and improves circulation and mobility. Natural Medicine & Rehabilitation provided their Foot & Arch Scan to the members of Gold’s Gym. This screening assessment can begin to detect mechanical foot problems such as altered arch heights (flat feet) and weight bearing imbalances, that can create pain and problems from the foot all the way to the spine. Dr. Sferra was asked to speak to the employees at Colgate-Palmolive to help educate them on boosting and optimizing their body’s natural defenses with therapeutic lifestyle changes involving rest, nutrition, exercise and stress tempering activities that will help keep them healthy during the upcoming cold and flu season. Natural Medicine & Rehabilitation provide therapeutic chair massages to the employees at this location to help them learn about stress tempering techniques that are helpful during the Holiday season. NMR was asked to participate in the Community Health and Flu Clinic event held at the North Plainfield Community Center. NMR was invited to attend the Golden Lions event for the staff and students of RVCC. Massage therapy was provided as participants learned how this can help improve circulation, mobility and even help to relieve headaches. NMR was asked to support the Employee Health & Safety Fair for the Somerset County Parks Commission. Employees were able to enjoy massage therapy to help ease away both physical and mental stress. The Manville Department of Health asked NMR to support their Annual Health Fair held at the Public Library for the residents of Manville. The Bridgewater Health Department invited NMR to their annual Community Health Fair. Participants were able to receive one-on-one personal health information during the wellness screening NMR provided. NMR provided the Body Composition and Diet Screenings to the employees at OFS. This screening helps identify a person’s body composition in terms of lean muscle tissue versus percentage of body fat for a better understanding of their health status. NMR provided Therapeutic Chair Massage at the Central New Jersey Heart Walk in Piscataway in an effort to support their educational efforts about cardiovascular disease. NMR was invited to support the Affinity Annual Health Fair by providing the Foot and Arch Scan to their employees. The goal of their health fair was to increase health awareness and disease prevention by providing health screenings and educational information. Dr. Sferra was asked to present his Osteoporosis lecture at Colgate-Palmolive in support of World Osteoporosis Day on 10/20. Participants learned how to maintain healthy bones for life while attending his seminar. NMR provided Therapeutic Chair Massages to the members of Gold’s Gym. Massage therapy is especially helpful after a strenuous workout! NMR was invited to the J&J Safety Fair to help educate the employees by making the Body Stress Assessment screening available to them. This screening measures the degree of physical stress that one’s posture is placing on the body. NMR was asked to support Mental Health Day at RVCC. Students and staff members were able to meet with one of our staff members to learn how to relieve stress and enjoy a relaxing massage. Dr. Sferra presented his Osteoporosis seminar at the Cordis location to help attendees learn the lifestyle choices that promote healthy bones to prevent bone density loss. Dr. Sferra presented Maintaining Healthy Bones for Life to educate participants that the reasons people develop osteoporosis go beyond just calcium intake and estrogen levels. NMR was asked to coordinate a Wellness Week for The Arc of Hunterdon. Employees enjoyed several screenings and a seminar to educate them on the different aspects of preventative healthcare to enable a healthier, happier and more productive family, home and work life. NMR was asked to provide a health screening to support the Annual Health Fair at J&J Cordis. Employees were able to participate in the Foot & Arch Scan we provided to help detect mechanical foot problems that can create pain from the foot all the way to the spine. NMR visited the Somerville High School during ‘Finals Week” to provide a health screening which educated the participants and helped to relieve stress and anxiety. NMR supported Alternative’s Staff Appreciation Day by providing Therapeutic Chair Massages at their event. The employees were able to relax and rejuvenate while enjoying a few minutes of massage. NMR was invited to attend Ingredion’s Safety Week. Using NMR’s wellness programs to providing employees with educational seminars and screenings helps to meet company safety goals and objectives. NMR was asked to attend the Alternative’s Let’s Get Physical Fitness Challenge to provide the Body Composition Screening. Participants were able to learn about their body composition in terms of lean muscle tissue versus percentage of body fat. Personal dietary and nutritional habits were reviewed with each participant, and suggestions made to help them get on the road to healthy eating. NMR attended the Arc of Somerset’s Employee Benefit Fair and provided health & wellness information at their screening to support this event. NMR was invited to attend the Annual Environmental Health & Safety Fair at the J&J Janssen location in Raritan. This annual event was held outside under their solar panels as the employees were able to participate in the Posture Analysis screening provided by NMR. NMR was asked to provide a health & wellness screening for the employees of J&J in Titusville during their Annual Health Fair. The Body Stress Assessment Screening was provided to help people recognize how postural stress may be affecting their health. Natural Medicine & Rehabilitation was asked to provide health & wellness information to the employees at Imclome during their Safety Fair. Body Composition Screenings and Nutrition Consultations were made available to educate participants for a better understanding of their health. Dr. Sferra was asked to present information on Stress Management to the employees at Allergan. His enlightening presentation on stress, its effects, and techniques for tempering its toll on the body, entitled Living with Stress in Today’s World, was unanimously well received. NMR’s Health & Wellness information and a stress reducing screening was provided for the Cegedim employees in Bedminster. Dr. Sferra was invited to present his Relieving Muscle Stress at the Workstation seminar to the Somerset County Administrative employees. After attending this seminar, attendees learned how to reduce muscle stress and tension and relax tight muscles right at their desk. Natural Medicine & Rehabilitation was asked to provide some health & wellness screenings to support the Community Health Fair sponsored by the Hillsborough Health Department. NMR supported the 21st Annual Golf Classic at The Fiddler’s Elbow Country Club. Therapeutic Chair Massages were provided to the golfers who attended this fundraising event for the Hunterdon Medical Center. Natural Medicine & Rehabilitation provided the Posture Analysis to help build awareness on the strain bad posture puts on the muscles and joints which can lead to Arthritis, muscle tension and is also a major cause of back & neck pain. NMR was invited to attend the Global Health Services annual Health Fair at the J&J World Headquarters. A complimentary health & wellness screening and educational information was provided for the employees at this event. National Correct Posture Month was celebrated at J&J by making NMR’s Posture Analysis available for their employees. This posture check can help identify physical and postural imbalances that can cause various health issues for all ages. Dr. Sferra was asked to educate the employees of Colgate on stress tempering techniques to help reduce the negative effects of stress on the body. His lecture, Living With Stress in Today’s World, was well received by all participants at Colgate. NMR attended their Community Wellness and Appreciation Day to make their Body Stress Assessment screening available during this health fair. NMR was invited to support the YMCA’s Healthy Kids Day, a community event for the surrounding towns of the Somerville YMCA. It was our pleasure to provide a health & wellness screenings to help educate the community. Natural Medicine & Rehabilitation was invited to The Arc of Hunterdon’s Administative Professionals Day event. The staff was pampered with Therapeutic Chair Massages to relax and rejuvenate the employees! NMR was invited once again to support the Teachers and Directors who attended the Partners in Education Conference held at Rutgers by providing them with health & wellness education. The Body Stress Screening educated the participants on how postural stress may be affecting their health and overall stress burden. NMR was invited to provide a health & wellness screening to the employees at Allergan in Bridgewater. Natural Medicine & Rehabilitation’s Foot & Arch Screening was made available at this J&J location in celebration of National Foot Awareness Month. Participants received personalized information regarding mechanical foot problems such as altered arch heights or weight bearing imbalances that can create pain & problems from the foot all the way to the spine. Natural Medicine & Rehabilitation was invited to visit Eisner Amper with one of their wellness programs to help their employees relieve stress during the Tax Season. Natural Medicine & Rehabilitation attended the Montgomery Township School’s in-service day. During the Health Fair, NMR provided a Body Stress Assessment to the staff members and educated them on how they can improve their health and reduce stress. NMR provided a wellness screening to support a Golden Lions event at the college. NMR’s Body Stress Assessment Screening was used to educate community members at a Health Fair that the Bridgewater Health Department organized. The Body Stress Screening is designed to help people recognize how postural stress may be affecting their health and overall stress burden. Dr. Sferra presented his Foods That Fight Pain seminar to the employees at Colgate. Participants learned how to reduce pain and inflammation through proper nutrition. Natural Medicine & Rehabilitation was invited to support a fund raising event for Crim School by providing one of the wellness programs at their event. Natural Medicine & Rehabilitation was asked to provide the Body Composition Screening to the employees at Ingredion. This screening uses infrared technology to determine the overall body fat / lean tissue ratio. Then the participant receives a brief consultation to learn about their body composition and its impact on cardiovascular disease. Natural Medicine & Rehabilitation was asked to attend the Pepsi Bottling Company’s Health Fair to help peak employee’s interest in their health. It was our pleasure to provide one of our wellness screening to help support their event. Dr. Sferra was invited to speak to the county administration department to bring health & wellness information to their employees. In support of National Nutrition Month, he presented his nutrition lecture entitled Foods That Fight Pain. Participants learned how to reduce pain and inflammation through proper nutrition. NMR provided The Body Composition Screening during the Health Fair at J&J in Raritan. Employees learned about their body composition and its impact on cardiovascular disease and their overall health status. They also received a personal review of their dietary and nutritional habits. NMR was asked to support RVCC’s Golden Lions Event by providing a wellness screening for their students and staff. Natural Medicine & Rehabilitation was invited to provide Therapeutic Chair Massages to the employees. Massage can help reduce your heart rate, relax your muscles and ease stress and anxiety. The Body Composition Screening was scheduled for the employees at J&J Janssen to help them start the new year off healthy and learn about their dietary and nutritional habits to get them on the road to healthy eating! Natural Medicine & Rehabilitation attended the RVCC Golden Lions Club Day to provide a health & wellness screening for their event. Natural Medicine & Rehabilitation visited New York Life to educate the employees on their body composition for a better understanding of their health status. Natural Medicine & Rehabilitation was asked to provide a wellness screening during the Martin Luther King, Jr. Community Service Day. Dr. Sferra was invited to present his Nutrition 101 lecture at Merrill Lynch to help provide sound nutritional concepts that are healthful and can be maintained for a lifetime. Dr. Sferra was asked to educate the employees at Merrill Lynch on the most common complaint presented to primary health care providers….fatigue! Participants learned what robs them of energy and what can be done to improve energy and vitality. NMR was asked to provide one of our wellness educational programs during a Golden Lions event held for the students and staff of RVCC. Dr. Sferra was invited to be the guest speaker to present his Immune Power seminar. Participants learned how to boost their own body’s natural defenses with therapeutic lifestyle changes involving rest, nutrition, exercise and stress tempering activities. NMR was asked to help the employees at Financial Resources start off the Holiday Season by educating them on Healthy Holiday eating. Employees received a personal review of their dietary and nutritional habits. NMR was invited to support the Health Fair by providing Body Composition Screenings and Nutritional consultation to help get on the road to healthy eating! NMR provided the Body Stress Assessment during the Bridgewater Department of Health Fair. This unique screening is designed to help peple recognize how postural stress may be affecting their health & overall stress burden. Janssen Global Services Health Fair was supported by with a Foot & Arch Screening and Therapeutic Chair Massages provided by Natural Medicine & Rehabilitation. NMR was asked to provide the Body Composition Screening and conduct Nutrition consultations during the Branchburg Health Fair. Natural Medicine & Rehabilitation was invited to the Environmental Health & Safety Fair. The theme of the event was Green Challenge. The guest speaker was the NJDEP Commissioner and the Somerset County Business Partnership was also in attendance. NMR provided the Foot & Arch Scan during this event. NMR was invited to support Convatec’s annual Employee Health & Wellness Fair. The Pain & Flexibility Screening assesses the flexibility and muscular balance of several key areas of the body that are common areas of pain, dysfunction and disability. NMR was asked to provide our Blood Pressure Screenings to help Financial Resources kick off their fundraising efforts for the Heart Walk! NMR was invited to support the annual Health Fair in North Plainfield. Therapeutic Chair Massages were provide for the community at this event. Natural Medicine & Rehabilitation was honored to share Health & Wellness information during The Family Fun Night at Auten Road School. This family event was presented by The Mayor’s Wellness Committee, the Red Ribbon Week Committee and the Hillsborough/Millstone Municipal Alliance. Dr. Sferra spoke to the employees at Merrill Lynch in Bridgewater. Participants learned how to heighten their defenses naturally in preparation for the upcoming Cold, Flu and allergy seasons. Dr. Sferra was invited to present his Immune Power seminar to help educate participants on how to boost and optimize the body’s natural defenses with therapeutic lifestyle changes involving rest, nutrition, exercise and stress tempering activities. Natural Medicine & Rehabilitation was invited to provide a few wellness screenings to the employees at Henkel. The Body Composition Screening was made available to identify a person’s lean muscle tissue versus their percentage of body fat followed by a brief nutrition consultation. The other screening assessed a persons flexibility and muscular balance of several key areas that are common areas of pain, dysfunction and disability. Dr. Sferra was invited to support the Health & Wellness event at OFS Laboratories. He presented his Stress Management Lecture and clinicians from NMR provided the Body Stress Assessment screening and Therapeutic Chair Massages to support their event. The Foot & Arch Scan was schedule at National Starch for its employees. An NMR clinician met with each participant during the screening to individually assess and detect mechanical foot problems that can create pain from the foot all the way to the spine. NMR’s Body Fat Composition Analysis was made available during Safety Week to help people identify their body composition in terms of lean muscle tissue versus percentage of body fat for a better understanding of their health status. Dr. Sferra was asked to present two of his Wellness Seminars during the Ingredion Safety Fair. Participants at the Relieving Muscle Stress at the Workstation seminar, benefited by learning how to relax tight muscles right at their workstation to reduce accumulated tension and muscular stress that plagues so many employees working at the computer. The participants at the Living With Stress in Today’s World seminar learned techniques for temping stress and the toll it has on the body. NMR supported the annual Safety Fair at Ingredion. The Therapeutic Chair Massages that were provided can help reduce ones heart rate, relax muscles, improve range of motion and increase production of the body’s natural painkillers. It also helps relieve stress and anxiety. NMR was invited to attend and support the 15th Annual Branchburg County Fair. This was a community event including music, food, activities, fireworks and a wellness screening by Natural Medicine & Rehabilitation. NMR supported the week long Safety Fair at Costco by providing therapeutic chair massages on the last day of the fair. Massage therapy aids in the relief of muscle spasms and helps reduce not only physical, but mental stress. Dr. Sferra provided a health screening at the Somerset County Employee Health Fair. He spoke to each participant regarding their body composition in terms of lean muscle versus percentage of body fat and conducted a personal review of their dietary and nutritional habits during the Body Fat Composition Screening. Natural Medicine & Rehabilitation attended the Annual Health Fair for the employees at Affinity. Participants received a unique health screening and brief consultation with recommendations on ways to start to improve their health and reduce postural stress immediately. Dr. Sferra presented his Headache seminar as one of the events during Dr. Reddy’s September Employee Health Fair. The seminar discussed ways to manage headaches through clinical nutrition, rehabilitation & therapeutic lifestyle changes to improve ones threshold to headache triggers. Johnson & Johnson invited NMR to support the Health & Safety Fair for the employees. A screening was provided to assess flexibility and muscular balance of several key ares of the body that are common areas of pain, dysfunction and disability. Natural Medicine & Rehabilitation was asked to support the Annual Safety Fair at Costco in Bridgewater. Posture screenings were made available to the employees. Our clinician was also able to conduct one on one consultations to discuss postural imbalances that may be contributing to symptoms such as headaches, neck and back pain, and muscle tension. Natural Medicine & Rehabilitation was asked to provide a health screening to support Dr. Reddy’s Health Fair events during the month of September. The Bridgewater location of Imclone held its annual Safety Fair and NMR was asked to make its Body Fat Composition Analysis available during this time. Participants received a personal review of their dietary & nutritional habits and information on how to get on the road to healthy eating! Johnson & Johnson’s Information Technology Services held its annual Summer Environmental Health & Safety Fair. NMR was asked to support this event by providing a health screening to promote pro-active disease prevention and personalized health information for its employees. Natural Medicine & Rehabilitation was asked to return to the Arc of Somerset with the unique health screening we provide to help people recognize how postural stress may be affecting their health. NMR provided Therapeutic Chair Massages to the employees at Imclone to help reduce physical & mental stress. This also provided an opportunity for participants to receive personalized health information from our clinical staff. Natural Medicine & Rehabilitation visited Cegedim in Bedminster to provide one of our on-site health screenings for their employees. Natural Medicine & Rehabilitation provided Therapeutic Chair Massages to the employees at DS&D in Branchburg. Massage can relax your muscles, help reduce stress & anxiety and rejuvenates you! Natural Medicine & Rehabilitation attended the Annual Health & Wellness Fair for the 325 employees at the Arc of Somerset. Personalized health information was provided during our health screening at the fair. Natural Medicine & Rehabilitation was invited to New York Life to provide a health & wellness service to help relieve stress & anxiety. Blood pressure testing was made available to all employees to support a Healthy Heart event at Financial Resources. Uncontrolled high blood pressure can be a fatal condition if left untreated. The only way to determine if you have high blood pressure is to have it checked! Dr. Sferra was asked to speak at Imcone in Branchburg on the topic of Fatigue. During his lecture, Solutions for an Exhausted Society, employees learned what robs them of energy and what can be done to improve energy and vitality! Dr. Sferra was invited to speak at the Bridgewater Municipal Complex. His Relieving Muscle Stress at the Workstation Lecture was part of the Bag Lunch Employee Workshop to support the Mayor’s Wellness Program. This presentation is geared for those with muscular stress and tension which typically accumulates from desk or computer work. Prior to the lecture, Therapeutic Chair Massages were provided to help relieve stress. Body Stress Screenings were offered at a Community Health Fair held at the Family of Christ Praise & Worship Center. The screening educated the participants on postural imbalances they may have and how this can contribute to headaches, neck & back pain and muscle tension. held their annual Energy, Environmental, Health, Safety and Sustainability Fair in conjunction with a dedication ceremony for their new solar canopies. NMR was honored to attend this event with one of our educational health & wellness screenings. Cegedim’s Annual Health Fair was enhanced with the Body Stress Assessment screening provided by Natural Medicine & Rehabilitation. The participants were able to learn how their postural imbalances may be contributing to various health symptoms. Natural Medicine & Rehabilitation was invited to bring one of their wellness programs to an event for the parents of Kangaroo Kids. NMR was invited to attend the Annual Safety Fair held at Imclone. The Body Stress Assessment was made available during the Safety Fair to help people recognize how postural stress may be affecting their health and overall stress burden. Natural Medicine & Rehabilitation provided Therapeutic Chair Massages for a Teacher Appreciation event. Therapeutic Chair Massages were made available to the staff at Eisenhower School as a health & wellness service provided by NMR in support of Teacher Appreciation Day. LifeCell invited NMR to support their Annual Wellness Fair with one of our educational programs. The Foot & Arch Scan we provided is a computerized screening that can begin to detect mechanical foot problems such as altered arch heights, and weight bearing imbalances that can cause pain & problems from the foot all the way to the spine. DS&D made several of NMR’s wellness screenings available to their employees during their Health Fair. Employees received consultation regarding their dietary habits, body composition and blood pressure. In support of Employee Health & Fitness Day, Natural Medicine & Rehabilitation was invited to provide wellness programs for their employees. The participants learned about their dietary habits, physical fitness and its impact one their overall health status. The Body Stress Screening was made available at the annual Health Fair for the Colgate-Palmolive company. Natural Medicine & Rehabilitation was asked to attend once again, and provide wellness education programs during their Health Fair. Natural Medicine & Rehabilitation was invited to attend the annual Health Fair sponsored by J&J Global Health Services. Their goal was to create an enjoyable and educational atmosphere for their employees to learn about nutrition and physical activity resources. We were happy to support them with one of our wellness programs. Massage, one of the oldest methods of health care, was provided for the staff and parents to enjoy! This therapeutic service can help reduce your heart rate, relax your muscles and relieve stress and anxiety. Natural Medicine & Rehabilitation pampered the staff at Apples & Books with Therapeutic Chair Massages for Teacher Appreciation Week. The staff at Crim Primary School were pampered by one of the wellness programs provided by Natural Medicine & Rehabilitation for their Staff Appreciation event. Natural Medicine & Rehabilitation provided therapeutic chair massages to help support their Employee Health & Fitness Day event. Natural Medicine & Rehabilitation was asked to support the Child Development Center’s Month of the Young Child event. Dr. Sferra was invited to present Smart Food Choices to Get the Results You Want. His seminar has helped people clear up the confusion on what they should be eating to improve ones energy, strength and body composition. Natural Medicine & Rehabilitation was invited to the Staff Appreciation Day to provide one of our wellness programs. The staff at Van Derveer School enjoyed Therapeutic Chair Massages provided by Natural Medicine & Rehabilitation during a Teacher Appreciation Event. Therapeutic Chair Massages were enjoyed by the staff during Teacher Appreciation Day. In support of National Foot Awareness Month, Natural Medicine & Rehabilitation was asked to provide the Foot & Arch Scan to the employees at New York Life. The Golden Lion Sponsors were invited to attend the Hawaiian/Polynesian Luau themed End of Year Picnic on the RVCC campus. Natural Medicine & Rehabilitation was honored to attend and support their event with one of our health & wellness programs. Natural Medicine & Rehabilitation attended a Teacher Appreciation Event to pamper the staff with Therapeutic Chair Massages which helps to reduce not only physical but mental stress too. The staff at Somerville Preschool were able to ease away stress, relax and rejuvenate while enjoying the Therapeutic Chair Massages provided by Natural Medicine & Rehabilitation. Natural Medicine & Rehabilitation was invited to provide Therapeutic Chair Massages in honor of Teacher Appreciation. Dr. Sferra was asked to present his Overcoming Weight Loss Resistance seminar to educate their employees on the fundamentals to long term weight management success. Participants learned the key factors to weight loss resistance and action steps to take for a healthier body. 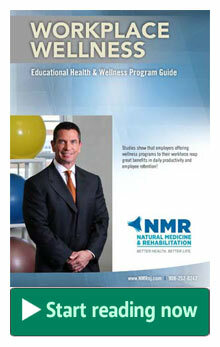 Natural Medicine & Rehabilitation was invited to provide our Body Stress Assessment Screening for their employees. This unique screening helps people recognize how postural stress may be affecting their health & overall stress burden. J&J hosted the Foods that Fight Pain seminar presented by Dr. Sferra. This presentation explains how to reduce pain and inflammation through proper nutrition. In and effort to relieve stress during the tax season, Natural Medicine & Rehabilitation was invited to provide Therapeutic Chair Massages. Massage therapy aids in the relief of muscle spasms and helps reduce physical and mental stress. Dr. Sferra was invited to provide health education at a mandatory employee seminar titled Foods that Fight Pain. Participants learned the nutritional effects on our body’s chemistry as it relates to chronic pain & inflammation. Natural Medicine & Rehabilitation provided health & wellness screenings at the Partners in Education conference attended by school principals, teachers, day care owners, directors and educators. Natural Medicine & Rehabilitation coordinated a community health fair with the Health Office in Bridgewater. NMR provided a Foot & Arch Scan which detects weight bearing imbalances that can create pain and problems from the foot all the way to the spine. Dr. Sferra presented Smart Food Choices to help support a Weight Loss Program at National Starch. This seminar clears up the confusion of what you should be eating to get the results you want. Therapeutic Chair Massages were provided by NMR as a stress reliever for the employees during tax season. Participants were able to ease away their stress, relax and rejuvenate! In support of National Nutrition Month, NMR was invited to provide a Body Composition Screening and Diet Analysis. Cordis employees received a personal review of their nutritional habits and learned their body composition for a better understanding of their health status. Natural Medicine & Rehabilitation facilitated the Exercise Made Easy seminar to help those who are not sure how to properly and safely execute basic exercises for overall body toning and conditioning. They learned the benefits of exercise and were able to actively participate in a supportive, safe and fun environment. The Body Composition Screening was provided at J&J’s Black History Celebration & Health Fair. Natural Medicine & Rehabilitation’s screening was able to determine one’s body fat versus lean tissue ratios and its impact on cardiovascular disease. Natural Medicine & Rehabilitation supported Merrill Lynch’s Biggest Loser Weight Loss Program. Since weight alone is not a good measure on one’s health, the screening also looked at waist to hip ratio and ones percentage of lean tissue versus body fat. Dietary and nutritional habits were also reviewed. Dr. Sferra was asked to help kick off Colgate’s new Live Better Zone by presenting his Health Heart Lecture. Individuals learn to empower themselves to take control of the risk factors to prevent heart disease. The Go Red for Women event held at New York Life was attended by Natural Medicine & Rehabilitation. A health and wellness service was provided to support their event to raise awareness of heart disease. The American Heart Association invited Natural Medicine & Rehabilitation to attend a Go Red for Women event held at J&J in Bridgewater. It was our pleasure to partner with them to help raise awareness of the risks of heart disease in women. Natural Medicine & Rehabilitation was invited to help the employees with their New Year’s Resolutions to Lose Weight. All received a personal review of their dietary & nutritional habits and were assisted in setting realistic and attainable goals. Affinity employees enjoyed identifying their body composition in terms of lean muscle tissue versus body fat. Natural Medicine & Rehabilitation’s screening also helped determine their BMI and provided them with assistance in setting 3 month goals. Natural Medicine & Rehabilitation’s health screening to kick off a healthier you in 2012 was made available to the Johnson & Johnson employees. Participants enjoyed one-on-one attention regarding their weight loss goals.